What should we make of Glenn Frey’s cause of death? The passing of Glenn Frey and his family’s revelation that his death was in part due to the rheumatoid arthritis he struggled with for many years hit the #rheum community hard. When I shared the news on Facebook, people expressed surprise that Glenn’s diagnosis was hidden from his fans, and that the press minimized the disease even though it was listed in his cause of death. Rheumatoid Arthritis is just a little something that causes swelling in the hands and feet… Now where have we heard that before? Try here. Or check out RAW’s Rheumatoid Disease Hall of Shame. So the shock of Glenn’s death combined with amazement that it was in part due to the same diagnosis many of us or our loved ones share was intensified by the media’s usual insistence that this disease is really nothing to worry about. Some Eagles’ fans living with RD wondered aloud if maybe Glenn Frey’s cause of death could help awareness of RD. I remembered what I’ve written so many times: People will understand if we make them listen. No one will do it for us. We’ll have to join together and be our own celebrities and make this disease famous instead. Blame the RD or the medicines? As a Christian, I believe death is our enemy. Some things are out of our control, but I’ve always urged warriors to fight for life – your best life, as much as you can get. Part of that is being informed, making choices, doing what seems best. That’s doubtless what Glenn and his doctors did. Meaning in Glenn Frey’s cause of death? The Eagles’ music has meant so much to me. Every song seems to help me make sense of life when it doesn’t make sense. Roo can tell you how passionately I sing Eagles’ songs driving my truck. I’ll cry with Hotel California because “you can check out but you can never leave,” feel validated with Desperado, then soar high with Take it to the Limit, or smile with Already Gone. There’s so many! As for many of you I’m sure, music like the Eagles’ can help me keep fighting when I don’t think I can do it any more – those times when you really don’t think you can face one more day of severe pain, full shoulders of responsibility, meds that don’t help, and people who won’t get it. We had a few warriors in that situation this week. Three were men. That’s unusual because RD is rarer in men; men are less likely to admit they’ve hit bottom with an illness; and men are even less likely to share on social media. So how many men do these three represent? And how many women feel the same way? ~ V. posted twice on my Facebook Page that he is tempted to take his own life because he can’t take it any more. We’ve seen more than one suicide due to RD. ~ Then there’s J. who commented on a blog post that he’s “seriously close” to the end of his rope. I remember crying the first time I thought about RA hearing Hotel California “you can never leave.” My hand was swollen up like a balloon. I’d just left a large research meeting where no one seemed to grasp the plight of people with rheumatoid disease (PRD). I went home and wrote about ivory towers: how can they ever understand? Now, I wonder how we could ever show the world that RD is more than just a little swelling in the hands and feet when a beloved musician dies from RD-related complications, and it’s still shrugged off? For today I have two answers. 1) Do what I can together with you through the Rheumatoid Patient Foundation. 2) Of course, I am going to go home and play Eagles CDs again tonight. What can WE do NOW for awareness of the REAL rheumatoid disease? 1. MARK YOUR CALENDAR for Rheumatoid Awareness Day Feb 2! Read here about what folks have done to celebrate in past years. 2. 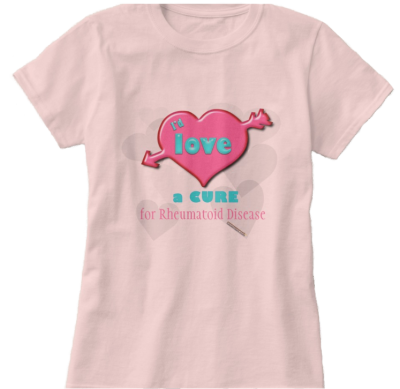 Or get a new t-shirt or mug to spread awareness. Lots of new hearts just in time for Valentine’s Day! This link takes you to the new heart goodies. To check out the rest of the store, click on my picture. If you want to see everything, click RA Warrior Wear, and then Products. I am sitting here typing with my left hand since my right is in a cast. I had surgery to realign my fingers and fix the knuckles – my 9th RA surgery, and yet I am not doing so badly compared to those having trouble holding on. I did hear that a medication figured into the complications but it does not make me anxious to drop any of those that I take. If not for the medications I would be gone by now, or at the best totally unable to do anything for myself. Some friends periodically say they feel like giving up. As you age it gets harder. Pain is also an issue – the medication I got got post operative pain was ridiculous – they suggested 1 to 2 pills every 3 hours (I blogged about it) How is that patient centered care? You only get 3 hours relief at a time? Then you wake up, eat more and take another 3 hours worth of pills. It’s inhuman. Are you doing a blog carnival for RA day this year? I was so devastated with this news as was many others. My sister-in-law passed away January 1, 1998 at the young age of 54 also from rheumatoid arthritis and pneumonia. I too have rheumatoid arthritis and fibromyalgia so it really did make me think that I will not live as long with this disease. So many people think this disease is no big deal and that exercise would cure it. I so wish more was out there so the families of rheumatoid arthritis stricken people could understand more instead of criticizing them for not feeling good half the time. I never knew Glenn had RA. I was first dx with the disease when I was 20 months old. I am now 52. I had 2_knee replacements in the last 34 yrs, and continue to deal with the effects of this malady. When you tell someone you have RA, the reaction is usually — oh that’s all. No one knows how hard it is to cope with this, how fatigued one becomes. Biologics are a great advancement for treatment but a what cost? If it shortens a life span are they truly worth it? It’s weird. I feel as if I’ve lost a good friend. Like you Kelly, all of their songs have some kind of meaning to me. I think the problem with RD is it’s not a glamorous didease. Just a little pain and swelling. SMH. I wish he had shared it with the world, do folks might understand more. Reading about Glenn Frey’s death really hit home. My RA doc told me that if we don’t get my RA under control that I could lose all use of my hands in 10 years. Huge wake up call. He want to put me on a stronger med like Humira. But when I read the side effects of these biologics the cure seems worse than the disease. I have COPD and asthma. These stronger drugs can affect my lungs and my ability to breathe. Not to mention other possible serious side effects. Plus I am allergic to many meds (20+ and counting). How do you reconcile with yourself about this and what steps to take next? No easy answers. My heart hurts for what Glenn went thru. And for the grief his family is suffering with. I will keep fighting but you truly need the wisdom of Solomon to figure out what the next step in meds should be. I was diagnosed with RA over three years ago. I grapple with two attitudinal issues: (1) I don’t want to call attention to myself and my “infirmities” — which include fatigue, neuropathy in my feet, joint stiffness, two (highly successful) hand surgeries, inability to walk/exercise easily — you get the picture. And, (2) a desire that my family and friends understand what I deal with on a daily basis. The reaction to Glenn Frey’s death has been fascinating for me. Few individuals focus on his RA issues. Most focus on his digestive issues and his previous history of drug use. ANYWAY, sometimes I don’t know what I expect. Advocates for lung cancer screening and better funding for lung cancer face these issues of misinformation and inadequacy of funding all the time. I am grateful for the drugs that keep me from getting deformed, even though I have small side effects from them. I am grateful that I feel as well as I do — especially when I have friends who have metastatic cancer, serious cardiovascular illness, brain tumors and Parkinsons. Many of us face or will face a serious health problem before we die. So, I appreciate how your blog addresses the tension between getting on with life’s challenges with a spirit of gratitude and figuring out the best approaches for dealing with RA. I for one am glad the Frey family included information concerning RD in the press release. Often it does take a celebrity to bring needed attention to an issue. Patients try desperately to gain understanding about this disease, but to no avail. The struggle for understanding equals the struggle to manage this disease. How do we show the world what this disease is when Mayo Clinic defines it as “a chronic inflammatory disorder that typically affects the small joints in your hands and feet” and continues “sometimes can affect other organs of the body”. Yet, speak to any PRD and they can tell you specifically what other issues they have as a result of the RD. When first diagnosed, my rheum doc handed me a packet of info on MTX along with a legal release to sign before he would prescribe. I knew nothing about RD, but his words to me “get rid of the deer in the headlights look and get on with your life.” I was struggling to get out of a chair. My heart is heavy that even our specialists often do not understand the impact of this disease. Most of them do not have any idea. They actually believe what is on those sites & tell people “No, that can’t be happening to you because it’s rare” (according to the 28,000 comments here & many hundreds of thousands on social media). Sometimes we can’t even move and they act like it’s less than heartburn or a hangnail. That’s one reason why I built RA Warrior. Great post, Kelly. I’m so thankful you are here to touch those who feel they cannot endure living with RA. Your Light shines through as a message of hope. Regarding the responsibility of people in the public eye with certain medical conditions to help with advocacy: I am forever grateful that Stephen Hawking has spent the majority of his life focused on his career in science, research, writing, and teaching. He has not spent a lot of time as the spokesperson for his medical condition. We all need to be free to live the lives we feel led to live. What a tragedy it would be if Stephen Hawking succumbed to pressure to use what precious energy he has focused on an area best left to people who feel the calling to advocacy. Some ways I help raise public awareness: I ALWAYS post in the comments section of press releases that are misleading. Sometimes I will contact the author or the company responsible for the publication with more detailed information about RA and website links to some of my favorite RA resources. 1. 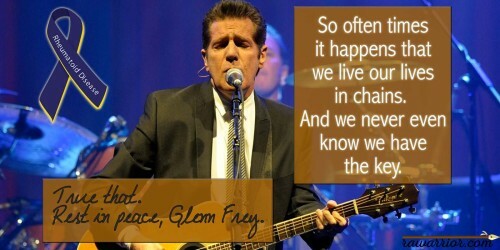 Share on your FB wall the news about Glenn Frey. Post a brief description about what RA is and provide links to reputable websites for further information. 2. Ask people to support the Rheumatoid Patient Foundation (RPF) and become a member. I also like rheumatoidarthritis.net as the language used on the website is easier to understand than the John Hopkins website. I understand that the Mayo Clinic Rheumatology Department will likely update their website sometime in the near future. There are newer sites like the one you mentioned show the huge impact this site & its community have had. On that one & all the big commercial health sites, you hear our words, themes, and rally cries echoed. Because it sells. So, we have had quite an impact in the past 7 yrs. You can see the ripples go out from what we say, if you watch the RD landscape. There was a lot behind the scenes w/that one & several other commercial sites that I decided not to partner with but I did not feel free to share publicly. And yes, I’ve had a talk w/ Mayo previously, and again after your contact. I know you’ll keep an eye out to see how this moves forward. And for whoever is reading I want to be quick to point out, I CANNOT BE THAT WORD OF ENCOURAGEMENT TO ALL COMMENTERS. You must reach out to one another as I know many do. I am not always there & I cannot do it all. Please share encouragement to warriors who are down. It’s ok if you don’t have the answer. Tell them you care & maybe offer a link to more info. 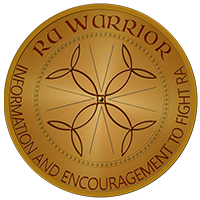 I began reading rawarrior.com after my RA diagnosis in 2012. 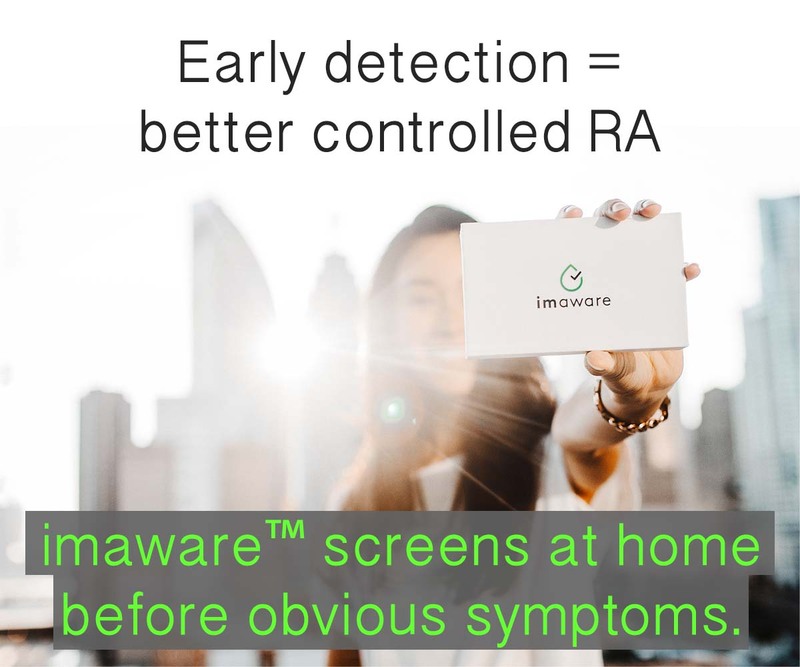 The impact of RA Warrior on the field of rheumatology and public awareness is beyond measure. I have no idea where I’d be without RA Warrior and other patient advocacy groups. The strength and comfort I’ve gained from these connections is amazing. I often think of middle-aged women with RA in small towns before the internet. How frightened and alone they must have felt. I am not implying that a celebrity should dedicate all of their time in advocacy, especially when they have talents and gifts better used in another area. No one said they have to give up anything – look at Michael J. Fox, Angelina Jolie, Bret Michaels, Toni Braxton and others. Marketing experts say nonprofits and charities devoted to specific diseases rely on having famous faces attached to that disease. Sally’s points above, #1 and #3, would not be viable if the Frey family had not mentioned RD in the press release. Thus, the celebrity connection is important. Their voice is instantly more powerful than the average person. If I post to social media about RD, few will even notice, some mock. However, if it is a celebrity, the public takes note — as seen by one of the top trending stories on social media the past few days. I host a forum for those with rheumatoid – it started over a year ago when things on RAW were quiet. It is a wonderful group who understands, encourages and supports. And, there is one point we all agree on – the difficulty associated with gaining understanding from the public, sometimes even our own families. We have tried with all the many people we interact with on a daily basis. Yet people most often respond based on their knowledge – and there is a critical lack of knowledge concerning RD. We are advocates, but, unfortunately, there are many individual efforts with no united front through a foundation to take the lead. My prayers go to the Frey family at their time of loss, but my gratitude goes to them for being open about his health. There is a patient foundation, by and for patients. We have accomplished a lot in a short time, but you’re right, there is much to do. Many people said they wanted such an organization, but haven’t necessarily participated. Since it’s grass roots, it’s still on all our shoulders, but RPF is a great megaphone of what people accomplish, as well as taking the lead in some things. I hope you’ll help get the word out. 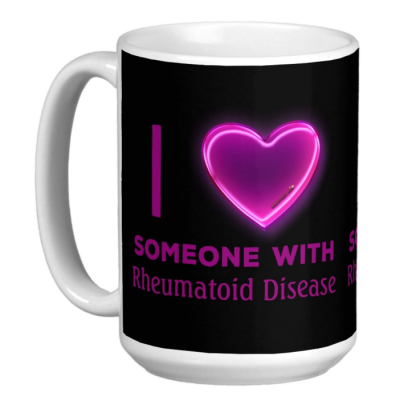 Rheumatoid Awareness Day is just a couple weeks away, Feb 2. Kelly I appreciate your blog so much and even with all of the sharing of information, my own experiences ect. People still don’t get it. I am a nurse and my rheumatologist made the comment to me that she wished that more of her patients were more proactive in their research as I was. (That is part of the nurse in me) in fact I am so confident in my research that I usually give the new information I find out and pass it on to my rheumatologist who will then follow up with her own research because I don’t have your atypical RA and have tried almost all of the biologics before I finally suggested the one I am on now (actemira) I am convinced that I will not live a very long life but intend to live what life I do have left to the fullest! I plan on leaving a legacy with my children and want them to pass down their wealth of knowledge knowing what they do know about this disease. (2 out of my 3 girls have RA) warriors we are, a warrior I am, in every aspect of my life from being in a physically and psychologically abusive marriage and dealing with this dreadful disease! I don’t have the funds to contribute towards research but what I do have is time. I intend on using my time left on this earth, enjoying what I have always enjoyed with some disabilities now, researching my heart out to educate those who really don’t know anything about the disease (even the medical professionals who don’t specialize in this field know less than some of their patients) and living my life through my daughters! After reading of Glenn Frey’s death, I started to search the ‘net’ statements from the Board of Rheumatology or the American Medical Association to thwart the horrendous damage caused by Glenn’s manager, Irving Azoff. He stated that Mr. Frey’s death was caused by (specifically) his medications. Such poor press without any of the elite medical community coming forth to dispel such nonsense boiled my blood. I will not drivel on re: my own circumstances, but I have had rheumatoid disease for 30 years as well as being a clinical Internal Medicine and Medical/Surgical hospital RN, educator and legal nurse consultant. That no-one took Mr. Azoff to the mat on his statements is deplorable within the medical community. It served a horrific injustice to the newer and less new pharmaceuticals out now (TNF-inhibitors/biologics etc.) that were NOT available to many of us years ago. The FDA approved the first biologic, Enbrel approximately 1998. Azoff was directed by his attorney’s to NOT mention certain pharmaceuticals. I have no doubt Glenn was on Remicaide infusions, as it was first used exclusively for those with ulcerative colitis and later served those with RA. Also, most likely Prednisone. He supposedly had RA for 15 years making him approximately 52 at disease onset. So to further his recording, touring, stage performances he needed these drugs. He consented, maybe with ignorance on the possible side effects, but would a man like this sit in a wheel chair? Doubt it. Frey made a comment that it was years of ” beer, burgers, blow and broads..” that caused his diverticulitis. He only started a manic exercise regimen in the late 80’s, and most likely changed his habits. Regardless, his comments show a lack of knowledge and understanding of his own disease process. Or a way to reduce the significance of his disease state to the public. He was hospitalized in November to remove a large portion of his lower colon. As I read article after article, it sounds as if he never left the hospital healthy. His recovery was supposed to be ‘very lengthy’ as his friend and band member, Henley stated. For those of you that are unaware of hospital acquired infections, they are many and rampant. Since his surgery was quite extensive by standards and probably required anastomosis, he most likely was immobile for a long time. He may have had some lung involvement from the RA, but the bottom line is, hospital acquired pneumonia is ‘common’ and much more so in those that are immunocompromised. For the sake of clarifying what happens before surgery, one must stop all immunosuppressive meds WEEKS before any surgical procedure. They must be stopped when infection is present. In summation, he was not on any meds to compromise his immune system prior to surgery, not was he infected. He was healthy enough to undergo surgery. I surmise his death occurred from the pneumonia and NOT from the meds he had been taking. Stay awake about 6 hours of the day. Thanks for letting me vent. I have asked my family to be sure that RD is listed as cause of death for me. Reading the article, seeing both the sadness (I’m so sad) and the fear, I felt I had to speak up. I have fibromyalgia, Chronic Epstien Barr (basically I get severe flares of mono despite us all not being able to figure out how I got exposed), and limitations, disability,from the injury that started it all, I also have a bulging deteriorating disc right in my lumbar area that keeps me from excercising the way I need to control the other dieases. I dated a man with Chrons disease. It almost killed him several times. I married a man with Ulcerative Colitis. His stepmother has RA and now fibro. She and I often commiserate. The symptoms I get, the swelling until I can’t walk on my feet or close my hands, the joint pain making it impossible to move more than a turtles pace and the husband helps. I wish Glenn Frey had come out and revealed his struggles with every disease he struggled with. I have some idea of the Chrons or UC due to having IBS-c&d. When we heard he’d died from complications to UC, I could see the fear in my husband’s eyes. As much as I think the RA definitely played a part in his death, having seen what chrons and UC does, I think the Severe version of it is probably what killed him in the end. It’s a miserable disease. Because it is located in the digestive track it weakens a person’s immune system by leaps and bounds. Our immune system is located their. UC/C patients often get so many ulcers that they have no choice but to remove segments of the intestine or colon. It causes body pain, swelling, days and days of having to run to the bathroom and pass blood right along with everything else. Because the way the disease attacks, it’s basically the bodies natural bacteria etc. thinking somethings wrong and attacking itself. So they get put on immune suppressants to stop the attack leaving them vulnerable to getting sick more frequently and making other illnesses intensify to dangerous levels. Like RA. I’m not going to get in a detailed description of life with a UC/C sufferer. It’s too hard to think about. But I wanted to tell of the people in these comments and the writer of this great editorial to not be so afraid. Not to lesson the Importance and suffering you go through, I’d wish that on no one other than pediphiles, abusers of animals the elderly and terrorists. I have been married five years and watched my step mom in law get her diagnosis for fibro, which mimics RA among other things. She was much more active,vibrant,youthful despite the enormous pain she lived with. I think if you don’t have UC/C you are less likely to be a candidate for death. I celebrate that because I know physical suffering. I watch her and my husband and don’t know how they manage to stay so strong. I don’t know if I’m wording this right at all. I just don’t want you to fear what may not be. Absolutely go to your RA doctors and ask the hard questions. Ask if you’re life threatened. Or does it require a secondary immunodeficiency illness to make it deadly. I’m going to be asking my doctor for sure. Meanwhile, the best I can say besides stay strong, be well and thank you all for being inspirations in fighting the much maligned “invisible diseases”; is maybe, if you can afford it, try looking into essential oils. They are incredibly good for you. And I haven’t bought any of the popular brands due to finances but I had some samples and some whole foods versions to put in my teas. Holistic is really the way to go.Peppermint is almost comically good for everything. But if you get the recipes you can create different combos that work just as well if not better than pharmaceuticals. I’ve taken what little I had, mixed it with products from the fridge and herb cabinet and made poultices for myself and husband. One instance was he took a bad fall and landed hard on his side. He was in so much pain. It was obviously a bone bruise. I made the young living essential oils recipe morphine bomb my way and had him put it on his worst pain spot using a washcloth. He kept reapplying and it took the pain. The recipes can remove inflammation,joint pain, tooth infections, migrains, treat your insides through recipes that have you adding them to your meals or making your own capsules to take. It works. I have no clue if it’s a cure, but it’s better than what the meds are doing to our bodies. And yes, there needs to be an awareness campaign for RA and all “invisible diseases”. We deserve to be heard and helped. Glenn Frey’s death seems to be a surprise to even some of his closest friends. How about strangers to this disease? Some are saying “What?” “How could he die of arthritis?” I personally think this shows how little people know about the seriousness of this disease and the nastiness of the drugs they give us. My mom had RA and landed in the hospital once with internal bleeding due to her RA meds. She was found to have 17 lacerations in the lining of her stomach due to them and almost bled out. So, I wasn’t surprised at all when I saw the ulcerative colitis and ulcers as part of what led to Glenn’s death. Kelly, thank you for bringing up Glenn Frey in your blog. Thank you everyone for sharing your comments. I have been an RA warrior for 11 years. Currently battling many sickly symptoms of autonomic neuropathy. Relocated recently so had to start over with new doctors. Has been disappointing and disheartening to say the least. As many of you have experienced. At this time I’m not here to go into my story, but to inquire. One of my questions was to see if anyone had any ideas on getting the word out? Sally, thanks so much for sharing your ideas. Autoimmune diseases are serious!! Rheumatoid Arthritis is unfortunately not!! We need to join together and be heard. Our lives depend on it. People have very little or no understanding at all what rheumatoid disease is and what damage it does. So many people I know including myself have no one to talk too. Do any of you have a local support group and if so how did you get started? I would be interested in starting support group for all autoimmune disease suffers. If you suffer from one autoimmune disease you are likely to have another or more as many of you are. I’d love to hear more on this topic. Error in my earlier post…meant to say Rheumatoid Arthritis is unfortunately not taken seriously! Have R.D. for 25 years. So tired, sometimes, want to give up, but not an option…..have a wonderful husband and supportive children also. So hard to know what those meds do to our inside. I am on sulfasalazine, low dose prednisone, unable to tolerate biological. My hands are deformed, but I can use them pretty well to write and hold things, my feet are also deformed, so goodby to most shoes, but I manage…. Just had knee replacement, that took a lot out of me, but I will rise over this too. Eating healthy, juicing and adrenal herbal have helped along the way…..we need to make people understand this is not “arthritis ” as they know it. Educate, educate…..
Oops, forgot to put full name….? oh boy. I hate to read this. It reinforces the negative anxious feelings I seem to have all the time lately. Is it being caused by the RD and its inflammatory process? Or by me worrying about it? I have actively been trying to stop the stress/anxiety/worry from creeping in as I keep telling myself that its hard to know if the heart palpitations I experience are from inflammation or stress. This is such a damning maddening disease. It easy to worry when your bloodwork comes back abnormal and you worry about cancer, worry about missed heartbeats, and then worry that your worry makes it worse. Worry about enbrel… take it too often and you get could get sepsis or whatnot… try to stretch out doses so you feel good enough, but not over suppress your system (my choice, not the drs) its a balance act that I’m constantly maintaining.. Thats not even the worry about all the other stuff life throws at you.. Thank you Kelly for starting this website for us. I thought Glenn Frey died from cancer or something like that. Researching it today I’m heartbroken twice now. I saw the Eagles in 1973 Desperado played on the piano I think Glenn played it. I’ve had RA since 2001 of course I had it before. I’m unable to find a rheumatologist that has any understanding or empathy or expertise. Ive been to 6, but I can’t drive so I rely on friend. That’s all I have left. This disease killed her neighbor who had 2 children under 5 year of age. People don’t get it. I am in bed 90% of my life and my rheumy thinks I’m doing great. As for remission luck few people seem to have that. I’m so sorry losing Glen Frey, and countless others, friends family, co workers to this disease. I was told die if you don’t take these medications that are dangerous to say the least. He’s my current Dr.LOL I had to write this to thank you, for posting our real experiences and continuing to take a stand for those of us that no one really understands. I also have ra. Going on 8 years. Diagnosed at age 27. Today I heard of Glenn’s death as a result of searching ra. Over the years of searching ra online I’m always bothered by the way ra is described and the symptoms. Lets be real. Most of us live in daily hell. Since having my third child my ra has been the worst yet and my doctor moved away. Soon after delivery I was back on enbrel which lead to drug induced Lupus. Taken off enbrel and back on prednisone. Back on Methotrexate which wasn’t enough relief. Now on Humira and methotrexate for 3 months with very little relief and feeling ill and run down while having to take care of my one years old and four year old. I have a very very supportive husband but let’s be real again the stress associated with ra also carries over to my husband and kids. Like many others I also don’t have a support system. My parents don’t speak about my ra. I usually don’t bring it up to friends because people don’t get it and don’t want to hear about something they don’t get. I asked my mom if she heard about Glenn and immediately she’s on the defense about how he really died. I’m glad I searched ra today. unfortunately I learned of Glenn’s passing but through his popularity, fame and ra I found this site. I am thankful i stumbled across this site today. Thank you. welcome Alisha. I was just brave enough yesterday to use the word hell. We just don’t want to upset others & there’s no way they can know how bad it is. I keep wishing people around me could know for just an hour or a moment. I have to admit, Glenn Frey’s death shook me in my boots. I have been struggling with some breathing problems associated with RA for some time and his pneumonia and death from “complication from RA medications” really scared me. Of course, I went to my Dr. (to ease my mind) and his assurance helped for sure. Anytime someone is diagnosed with a disease, it’s up to them to decide whether or not they want to go public. I tell very few people about my RA. That being said, I do wish Glenn Frey had been more public about his diagnosis, it would have helped so many (including me). Thank you for your continued support and information for our RA community. You are a blessing. Sending prayers to Glenn and his family. 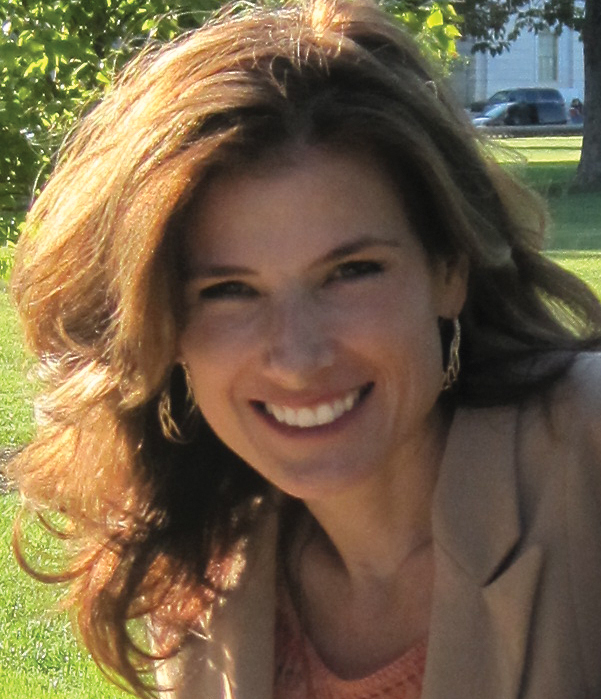 I thank everyone especially you Kelly for starting this blog and necessary dialogue. My last post was a bit harsh or prickly as my son would say. I’ve been through more than I care to detail here. I now have Ra, and Psa, fibromyalgia and more. I have uc/c or at least the symptoms. My hair is falling out, so I stopped methotrexate for not.A good thing I have quite a bit. I am looking for an alternative to this drug but don’t see too many options. Back to the drawing board again. I’m frustrated with lack of communication with Dr’s. I have many great doctors however not rheumatologists. The medicines for these diseases are scary. But you are forced to choose being partly in the world or not at all. I’m thankful for the honesty, comfort, understanding and being able to listen and talk to others who are experiencing this in their life thank you all so much for being here and your kind words, especially sharing your knowledge. It’s extremely helpful. This story begs a question: Is there any suggestion of a link in the disease process of RD and IBD(inflammatory bowel disease). As a child I lived with ulcerative colitis which was cured by surgery. As an adult I deal with RD. It seems notable that both conditions are treated with the same drugs. A note – When I was young I was told by a doctor that I was causing my colitis by over-stressing. Finding a more informed physician put me on the road to health. The stories I read of the experiences of many posters here sound all to familiar to me. I am in my 10th year with RD, and it is really beginning to show its teeth. I had a horrendous lung infection with plural effusions, and several months on antibiotics, back in the fall 2015. At the end of the day, a new diagnosis of sorts…Rheumatoid Lung. And I’m scared. Not afraid to die, I too am a Christian, I know what’s waiting for me, but I’m afraid to suffer, and I don’t want my loved ones to watch me slowly die from lack of oxygen. Everything I’ve read says after an RA Lung diagnosis, the average life expectancy is 2.5 to 4 years. I’m only 48. Some mornings, while I’m crying in the bathroom waiting for the pain killer to kick in so I can dress myself, I feel like I too am at the end of my rope. And now, as a crafter/knitter/crocheter, I’m trying to finish all my “to-do’s” like afghans, for friends and family members, and I feel like I’m running out of time and won’t finish before I die. The husband really won’t talk about it, he leaves the room or ignores me, I know its hard, but I NEED to talk about it sometimes. Or there are those on the other end of the spectrum like the lady at work who laughed at me and said “ohmygosh! LOLOL you think your dying? ?” *blank stare, crickets chirping…* All I could do is walk away. So I started a blog. To chronicle what I believe, is probably my last few years here, for my family and friends. The tag “arthritis”, in my opinion, has done a great dis-service to those of us who suffer from it. Most people do not know the difference between OA and RA. We need to continue to try and change that. Oh! And I wish somebody would inform all those dolts on youtube who post video’s telling us we can cure our RA just by changing our diet, become a vegan, use homeopathics, ______ fill in the blank. They don’t have a clue. I have been absent from the community from quite sometime for personal reasons. RD not only has devasting health effects, it has devastating effects on our relationships and family. When Glenn Frey passed, I was in the hospital fighting a Sepsis infection which was brought on by a severely compromised immune system. At the time I was hospitalized I did not realize how serious my condition was. Of course when we heard about Glenn Frey passing it home hard. I was fortunate to recover. But the recovery and the effects of the infection took longer to overcome than expected. Through Glenn Frey’s passing and my hospitalization, I came to realize the severity of RD, it’s complications and how serious the mortality rate for us is. My Rheumy felt like he almost killed me. He said this because he has seen patients pass due to complications and the drugs we use to treat RD. We have worked hard to rebuild my immune system, which is completely shot, by doing IVIG treatments for 3 months. By doing this we are hoping to give me something to fight off further infections. We are not sure where we are going to go right now treatment wise. 8 years of non stop prednisone and umpteen biologics with no success has left my Rheumy unsure of where to go. I am thankful for Kelly, her family and the community she has established here to support patients and the awareness of this very serious and dangerous disease. Every day is a fight one that we can let up on. Thank you Kelly for the opportunity to share again. I have always known that this community is vibrant and always there to support. God bless you all and take care! I am so glad that the cause of Glenn Frey’s death was made public. Barry Gibb of the BeeGees also suffers from severe RD. If you watch videos of past concerts you can see wrist splints as he attempts to play his guitar through the pain. If only those known to the public who suffer from RD would speak out and tell of their struggles it would increase awareness that RD is much more than a few swollen joints!!! I have had scleritis in my eyes, rheumatoid lung and rheumatoid vasculitis and someone in the medical field stated that I was an unusual case of RA …. but am I really unusual??? Kelly, thank you for all you have done for the RD community!